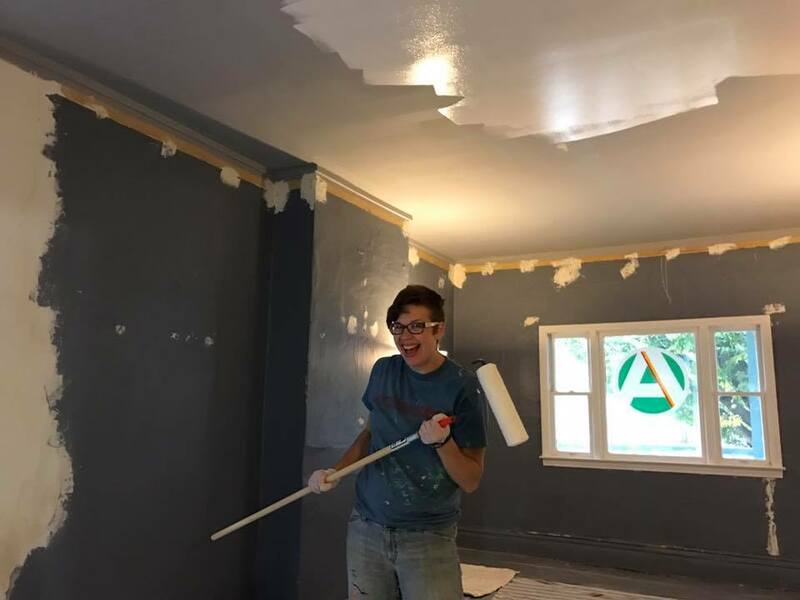 We’ve launched the second annual “$61 for 61” campaign to raise funds for the Allentown Association office location at 61 College St. Help your neighborhood association renovate and restore our new home! 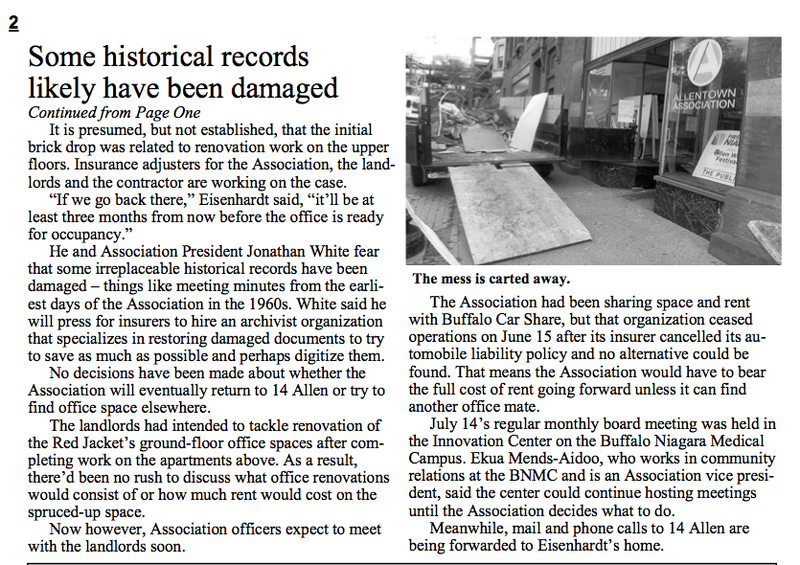 A little backstory…In July, 2015, falling bricks from the renovation of the Red Jacket building at the corner of Main and Allen Streets ruptured a water pipe, causing extensive damage and–ultimately–the ceiling collapse of the Allentown Association office at 14 Allen St. Many historical records, photos and documents were lost, and the Association was without a permanent home for over a year. After a district-wide search for a new home, a building committee settled on 61 College St.–just a half-block south of Allen St. Since moving into the location in October 2016, board members, volunteers and generous donors have made possible a number of improvements including new exterior railings, fresh paint, a larger conference room and renovated office spaces, and garden plantings just in time for Garden Walk 2017. Phase II: Exterior Rehabilitation – a multi-year phase that will address the water-damaged clapboard siding, installation of secure Bilco doors for the basement entrance, a secure shed in the backyard for equipment storage, and repair/restoration of historic wood windows. We will start this fall by stripping the north side and rear of the house, rebuilding the corner boards and eaves, and installing Hardie Board concrete siding, which will ensure the stability of the exterior for many decades, while retaining the historic character. Phase III: Interior Improvements – this phase will address cracked ceilings and walls, restoration of architectural moldings and details, and installation of energy efficient appliances / HVAC systems to be more sustainable in the future while being respectful of our historical heritage. 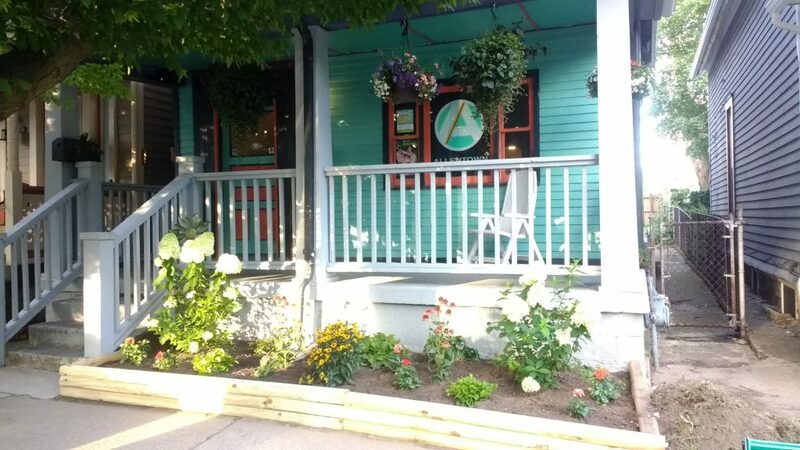 We’re asking you to donate $61 for 61 College St. so that we can further our renovations to the building and continue to do the important work of preserving our historic district, hosting amazing festivals, beautifying the neighborhood and more. If you can afford to donate more we’d appreciate the contribution, and if you can’t donate $61, any amount will be very much appreciated as it helps us move toward our goal. Donations of any size are accepted via check or online via PayPal. Click the “Donate” button below to make a secure contribution through PayPal. In the Special Instructions to Seller, please indicate the nature of your donation: “$61 for 61”. Make sure to check “Share my address” to receive your tax letter and other mailings! 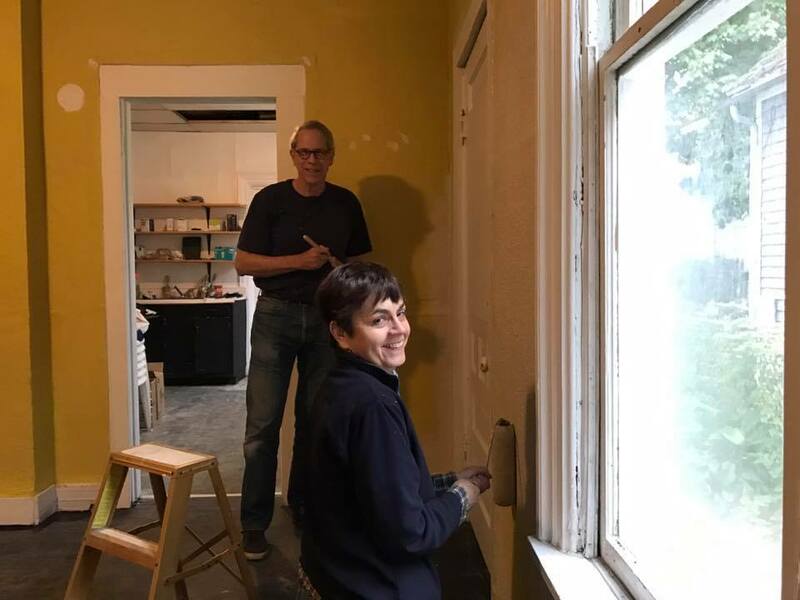 Allentown residents and members Bill Faught and Catherine Lincoln paint the office space of 61 College. Outreach Coordinator Laine Walnicki paints the meeting space at 61 College St. 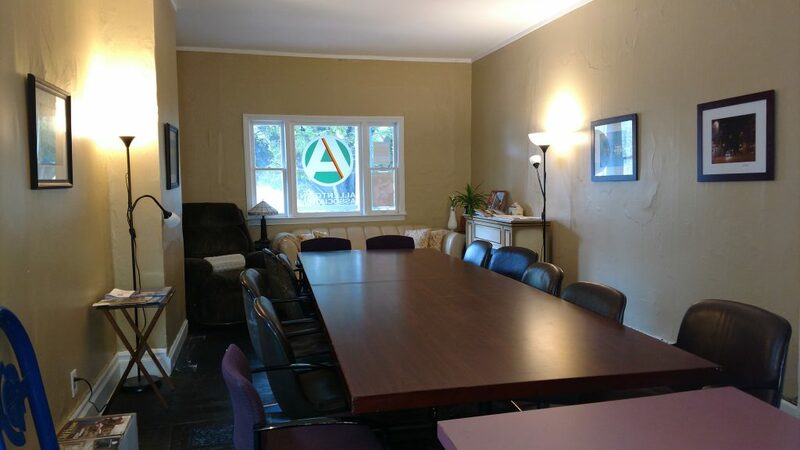 The refreshed meeting space at 61 College St. The new garden bed and plantings just in time for Garden Walk 2017. Why donate to the Allentown Association? Can you imagine Allentown without half of the buildings on Main St. between Allen and Virginia, or without every house on the east side of Irving St.? What about an expressway where Edward, Tupper and Virginia Streets currently are? Or having lost the Allendale Theater (Theater of Youth), the Birge Mansion on Symphony Circle or the Coit House, the oldest house in the City of Buffalo? The preservation work of the Allentown Association began in 1960 and continues today. Our board members and volunteers host monthly litter mobs to clean the neighborhood, First Fridays showcasing local artists and galleries, bringing hundreds and sometimes thousands of visitors to our neighborhood, and events like the annual Spring Dinner, Fall Festival and the extremely popular Allen West Festival. Your generosity not only allows the Association to expand its accessibility, it assures the preservation, restoration, and maintenance of a historic house as a community asset for future generations. We ask you to please be as generous as you are able so that we can build a presence for the long term. The Allentown Association, Inc. is a 501(c)(3) organization and your donation is fully tax deductible as allowable by law. All funds will be used directly for the rehabilitation of 61 College Street. Thank you so much for your support. We hope to see you at our 61 College St. office soon!